During factory assembly, foam insulators are installed in certain body panels and locations around the vehicle. 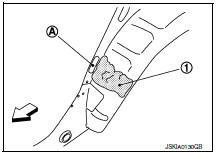 Use the following procedure(s) to replace any factory-installed foam insulators. Use commercially available Urethane foam for sealant (foam material) repair of material used on vehicle. Read instructions on product for fill procedures. Fill procedures after installation of service part. Eliminate foam material remaining on vehicle side. Clean area after eliminating form insulator and foam material. Insert nozzle into hole (A) near fill area and fill foam material (1) or fill enough to close gap with the service part. Clean area after eliminating foam insulator and foam material. Fill with enough foam material on the wheelhouse outer side to close the gap with the service part while avoiding the flange area. Refer to the label on the urethane foam container for information on working times.